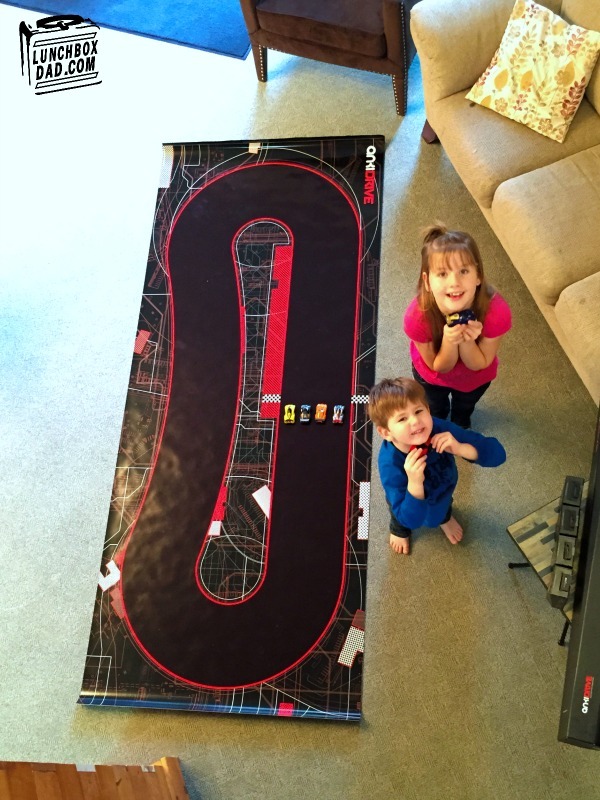 Lunchbox Dad: Review: Anki DRIVE Race Set, Family Fun or High Tech Flop? 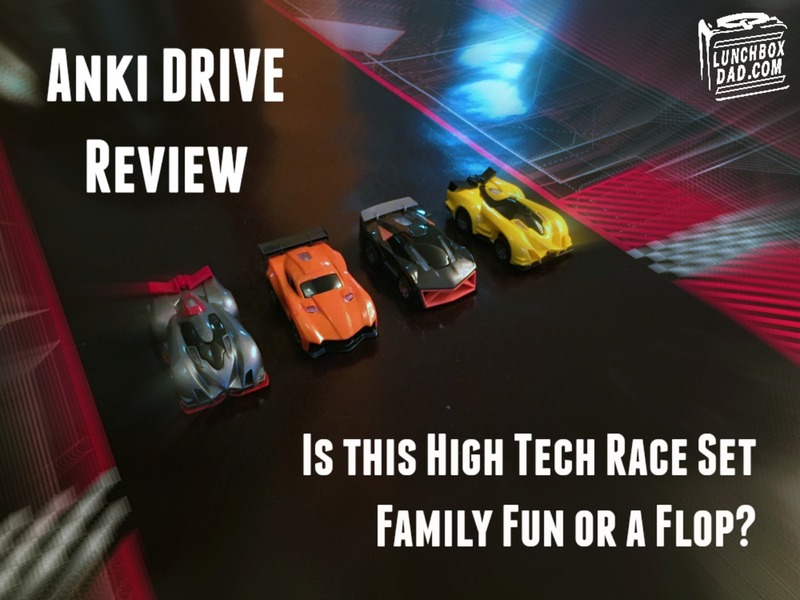 Review: Anki DRIVE Race Set, Family Fun or High Tech Flop? I'm always on the lookout for products that can help parents in different ways. It doesn't always have to be a parenting tool, sometimes it can be a really cool product that changes everything you know about toys. 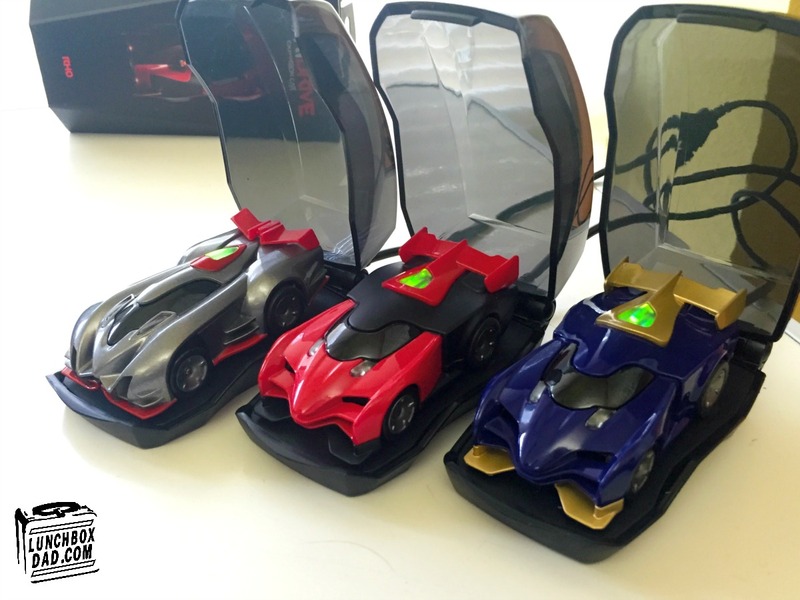 Actually, It might be unfair to call the Anki DRIVE just a toy. It is a toy, app, video game, and family competition all in one. Honestly it was nothing like I've ever experienced before. The race set comes in a long, fairly thick box. The packaging itself is pretty sleek and impressive. Before I opened it I thought, "this will be a shame to throw away." The practical side is that you keep the packaging because it is made to store all the parts in. The drawback is, due to it's size, it might be hard to find a good place to store it. Each starter set comes with a race mat, charger, two cars, car storage/charging docks, instructions, and wheel cleaner. Once you crack it open, it is fairly easy to get racing. First, roll out the race track mat. It is 3.5 x 8.5 ft. so it takes up a bit of room. Next, download the free app. Then, go through the tutorial. Last, race against your friend or the computer. 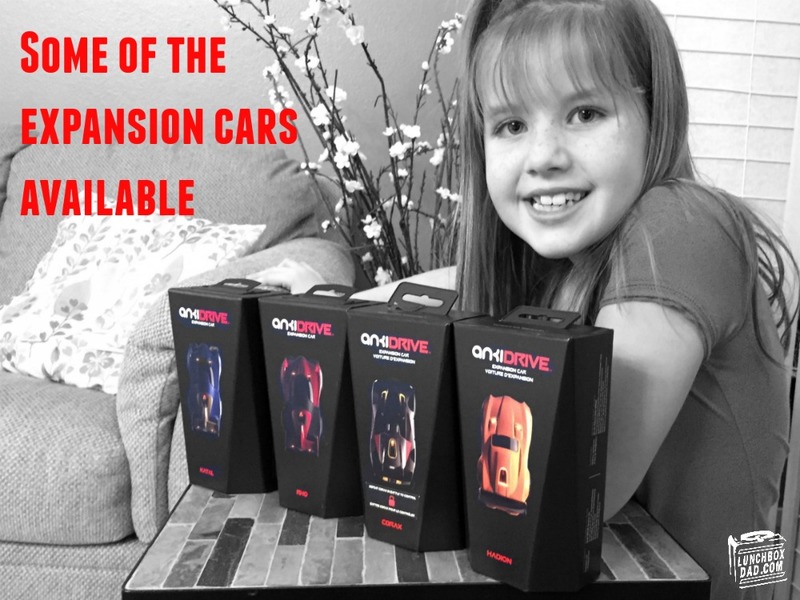 I tested the Anki DRIVE with all ages from my 4-year-old through older adults (it is recommended for ages 8 and up). I can honestly say most everyone who played was impressed. The nearest I can come to describing it is it's like Super Mario Kart, but in real life. It even reminded some adults of the old slot car race tracks. The beauty of the Anki DRIVE is that my kids had no problem getting the hang of driving. 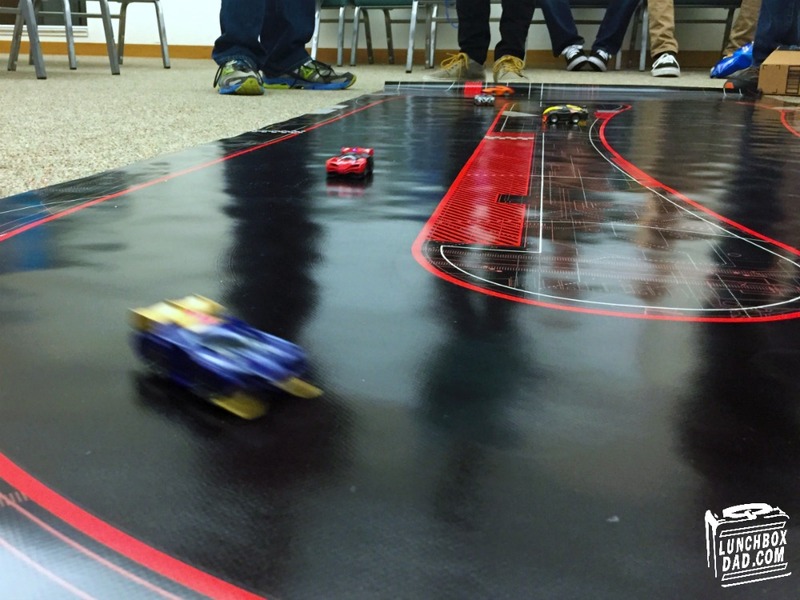 Unlike normal toy race tracks, you do not steer the car, it steers automatically. This means you don't have to go chase it under the couch and put it back on the track. You can control speed and tilt your phone to steer to the outside or inside lane. This lets you focus on the fun stuff like using the weapons. You are able to race against human opponents or an AI controlled robot car. Four cars can compete in each race. You can choose to compete in race or battle modes. A race consists of a set number of laps while battle is all out virtual destruction. Each car comes with specific weapons such as tractor beam, vulcan cannon, or speed boost. You can also buy upgrades for the cars using points collected by winning races. These upgrades can improve speed, steering, or even give you different weapons. Younger kids will have a harder time understanding when to use some of the weapons and how to upgrade the cars effectively. However, these features are exactly what keeps adults like me coming back to race again and again. My favorite car is the expansion car Corax. It is heavily armored and has the vulcan cannon and EMP blast. The EMP takes out cars immediately around you, which is helpful in a crowded race. A fun feature with Corax is that you must beat him in battle mode first before you can use him yourself. 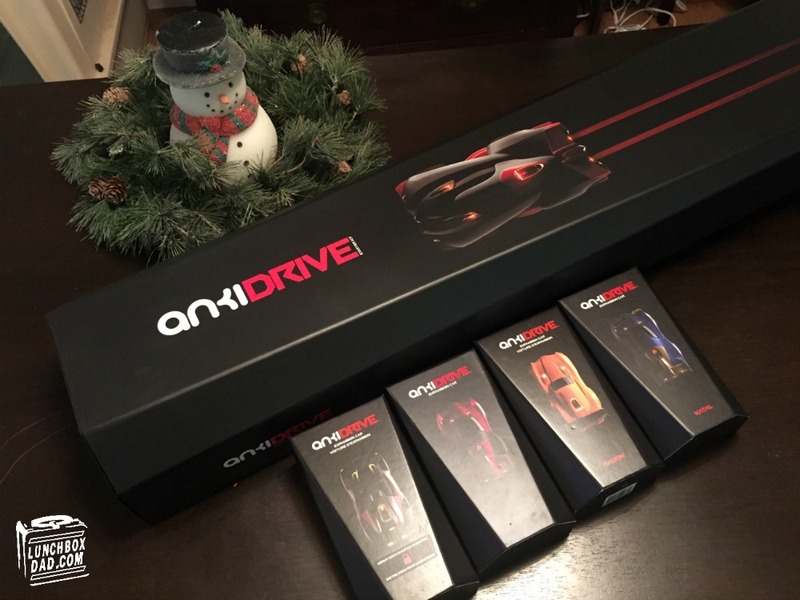 Anki DRIVE is a great idea with a myriad of future possibilities. They have recently released two new tracks as well. However, there are a few things to be aware of. Each player must have their own iPhone, iPod, or Android phone to play. Each phone must have the app and currently Apple devices cannot compete against Android devices. The track gets dirty easily and should not be stepped on. This can be a challenge around little kids. It can, however, be cleaned with Windex and a cloth. Each car lasts for around twenty minutes on a single charge. It takes eight to ten minutes to recharge. It really is more fun to have expansion cars so that you can continue to race while other cars are recharging (you can charge up to three cars at once). The issue is that buying more cars means a bigger investment. If you can get past these few challenges, then you and your family will have a ton of fun. Maybe you can tell by now that I highly recommend the Anki DRIVE. The starter set retails for $149.99, but I have seen it on sale recently for $99.99. Regardless, it is worth every penny. I tested this with about twenty-five kids, teenagers, and adults. When I told people the price, the were immediately looking it up to see where to buy it. Each expansion car retails for around $49.99 and comes with a separate charging/storage dock. This set is great for a family game night or when you get together with friends. It is also very portable. My advice is to get the Anki DRIVE. Now. You can buy it straight from their website, Target, or a number of other online retailers. Disclosure: I received these products for free from Anki DRIVE. I have received no other compensation for this post and the opinions I’m expressing here are solely my own.